Specific heat capacity (C) is the amount of heat required to change the temperature of a mass unit of a substance by one degree. 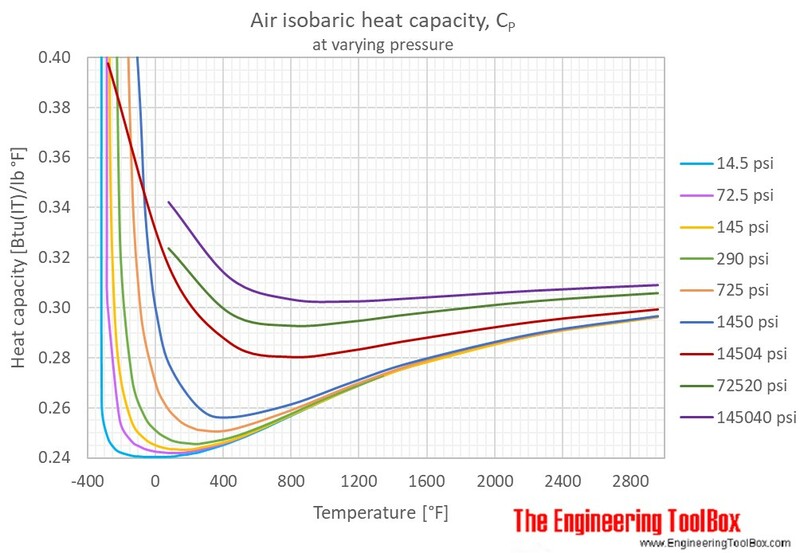 Isobaric heat capacity (Cp) is used for air in a constant pressure (ΔP = 0) system. 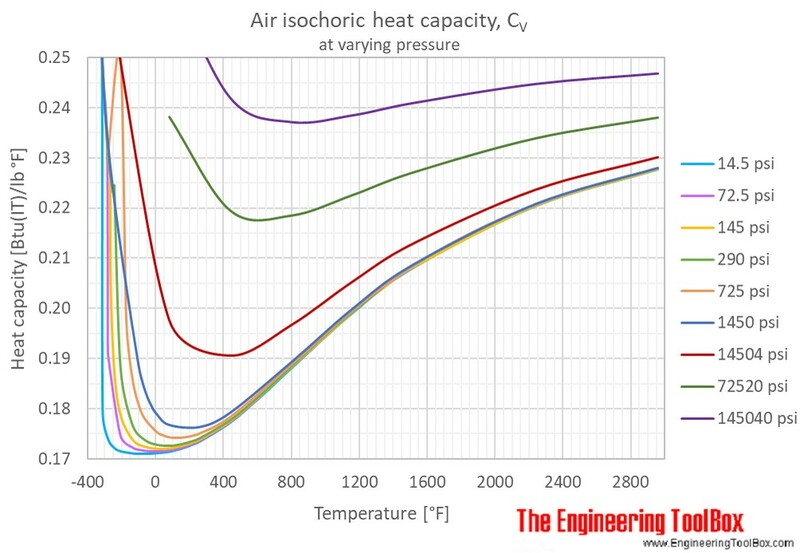 Isochoric heat capacity (Cv) is used for air in a constant-volume, (= isovolumetric or isometric) closed system. Note! At normal atmospheric pressure of 1.013 bar - the specific heat of dry air - CP and CV - will vary with temperature. 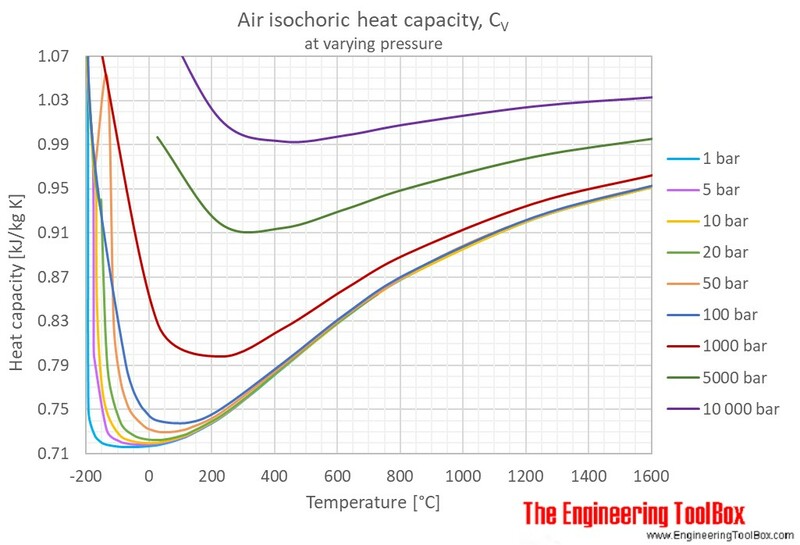 This may influence on the accuracy of air conditioning and industrial air handling process calculations. 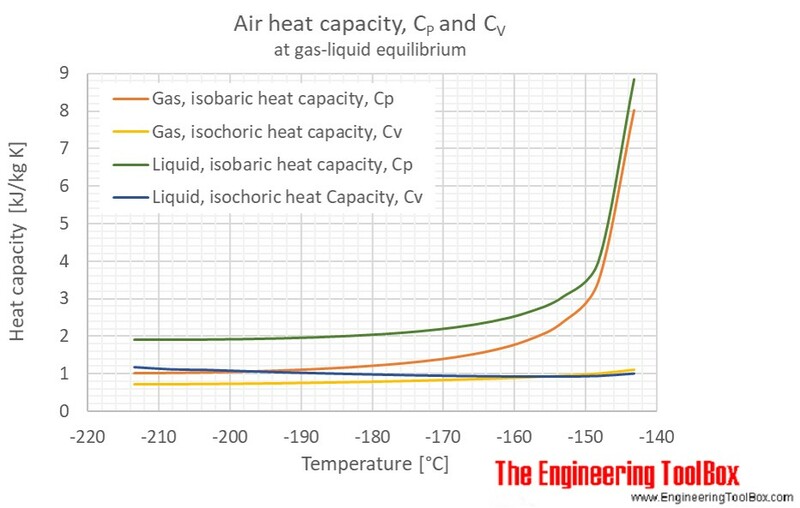 When calculating mass and volume flow of air in heated or cooled systems with high accuracy - the specific heat (= heat capacity) should be corrected according values in the figures and table below, or found by use of the calculator. The calculator below can be used to estimate the air heat capacity at constant volum or constant pressure and at given temperature and pressure. as well as Specific heat (Heat capacity) of Ammonia, Butane, Carbon dioxide, Carbon monoxide, Ethane, Ethanol, Ethylene, Hydrogen, Methane, Methanol, Nitrogen, Oxygen, Propane and Water. For full table with Isobaric heat capacity - rotate the screen! K in the units can be replaced by °C, and vise versa. °R in the units can be replaced by °F, and vise versa. Air - Density at varying pressure and constant temperatures - Figures and tables showing changes in air density at pressure varying from 1 to 10 000 bara (14.5 - 145000 psi) and constant, selected temperatures. Figures are given in different scales. Air - Properties at Gas-Liquid Equilibrium Conditions - Figures and tables showing how the properties of air changes along the boiling and condensation curves (temperature and pressure between triple point and critical point conditions). An air phase diagram are also given. Air - Thermal Conductivity - Online calculator, figures and tables showing air thermal conductivity at varying temperature and pressure, SI and imperial units. Specific Heat and Individual Gas Constant of Gases - Specific heat at constant volume, specific heat at constant pressure, specific heat ratio and individual gas constant - R - common gases as argon, air, ether, nitrogen and many more ..
Engineering ToolBox, (2004). Air - Specific Heat at Constant Pressure and Varying Temperature. 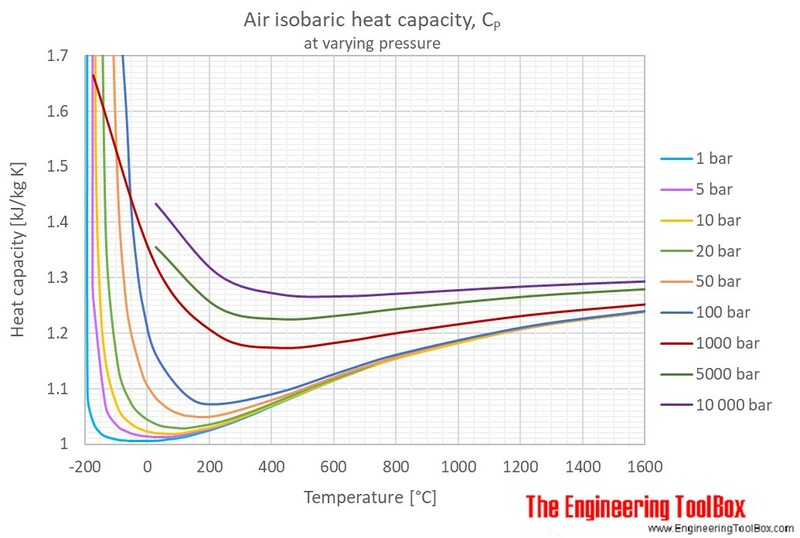 [online] Available at: https://www.engineeringtoolbox.com/air-specific-heat-capacity-d_705.html [Accessed Day Mo. Year].